I love the LM386. It’s a complete amplifier in an 8 pin DIP chip! All that is needed to build an audio amp are a few external components most of which are decoupling capacitors. It is well suited to low power applications and runs just fine on a 9 volt battery or any voltage supply from 4-12 volts. It has a low quiescent current drain of only 4mA so it won’t kill a battery right away if you leave it on and idle. The gain is internally set to 20 but the addition of an external resistor and capacitor between pins 1 and 8 will increase the gain to any value from 20 to 200. 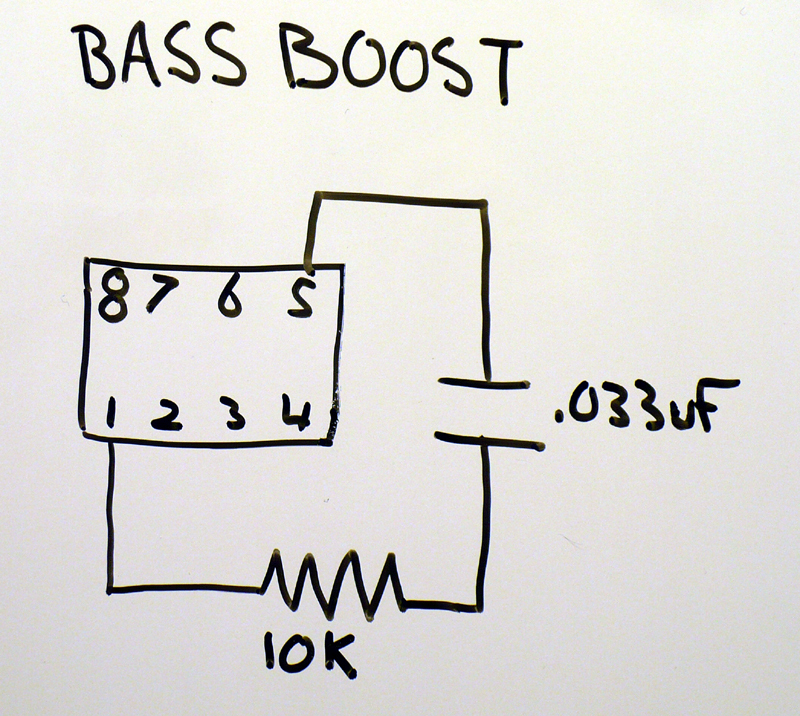 An increase in bass frequency can be facilitated by adding a 10K resistor and .033 uf capacitor in series between pins 1 and 5. A speaker of your choice for output. I suggest building the circuit on a bread board first. It’s much easier to troubleshoot and find errors and you can easily experiment with different components. You’ll also learn more as you can see what each component does by removing it or changing its value. You can leave the audio jacks off the output and install some small binding posts or just two wires with alligator clips on them for connection to an external speaker. 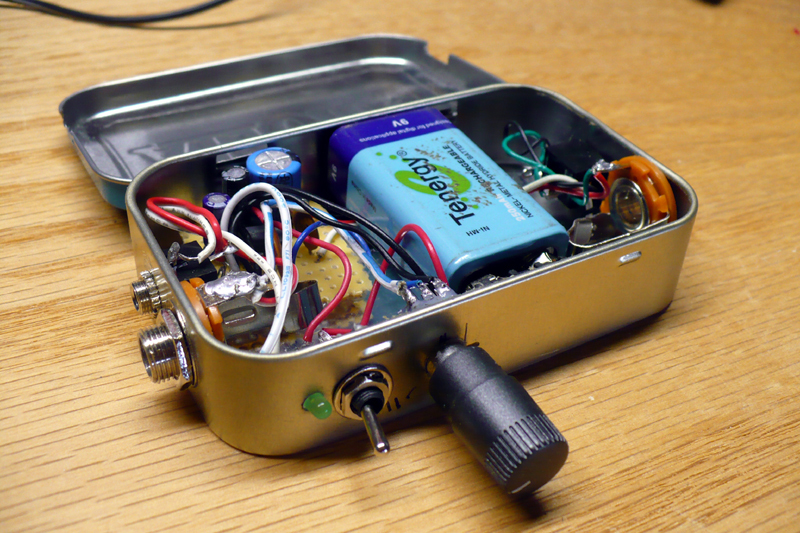 You could also put the whole circuit in a larger enclosure and install the speaker for an all in one portable amp. This amp can be used to amplify any low level audio signal like an mp3 player or even a guitar or bass as you’ll see in the video. All of the parts required can be found at Radio Shack and shouldn’t cost more than $20. Have fun building your amp and keep on hackin! I’ve never seen Altoids on sale in the UK, ironic really since they are manufactured in Wales and exported. Those tins look great for small projects. Perhaps they offer good for RF shielding for certain applications? I dig the Spinal Tap and Black Sabbath references too 🙂 Rock on Dino. I really like this application of the LM386! I was originally going to attempt a discrete component class A amp, but I think I’m going to follow this design instead. My goal is to implement a two-channel version with a switch to activate bass-boost. The 5mW/channel output of my walkman just doesn’t cut it! Any ideas on how to implement volume control on two of these while using only one control knob – maybe I could do some trickery with a series resistance in the gain circuit? Also, have you had any trouble with distortion resulting from hitting the power supply rails? I’m a bit concerned about the distortion I saw resulting from the output capacitance – I’m guessing that if I increased the capacitance I would see less distortion? I suppose that most of these questions could be resolved with experimentation, but I thought I’d at least try and see what I could find out beforehand! Thank you for this simple but effective schematic! This was my first time building something outside of the classroom, and we only used 74-series IC’s in that class. no resistors, capacitors, potentiometers, LEDs, diodes. honestly nothing but 7400 series chips. This was something that was complex enough that I had to think it through, do a fair amount of research(everything from ‘what does this mean on the schematic?’ to ‘crap, which cap is which?’), and had a blast building it. My little sister wants to build one for her bass guitar next weekend, and I am really looking forward to that. Again, thank you very much for taking the time to make a video, draw the schematic, and share it with the world at large. that many folks burn some of their chips out by doing so. Is this a chip that I would need to worry about that? Yes you can solder directly to the pins. Just don’t hold the heat there very long. It helps if you tin your wire first, tin the lead on the chip, then solder the two together. That way it only takes a brief time of applying teh soldering iron to the chip lead. Glad you liked and built the project and it’s always great to hear feedback. Have fun building the next one and be sure to visit Hack A Week each week for another project. I have just one question: the cap. connecting pins 1 and 8 is drawn as not polarized cap yet in the materials list you have it as a polarized 10 uF cap. 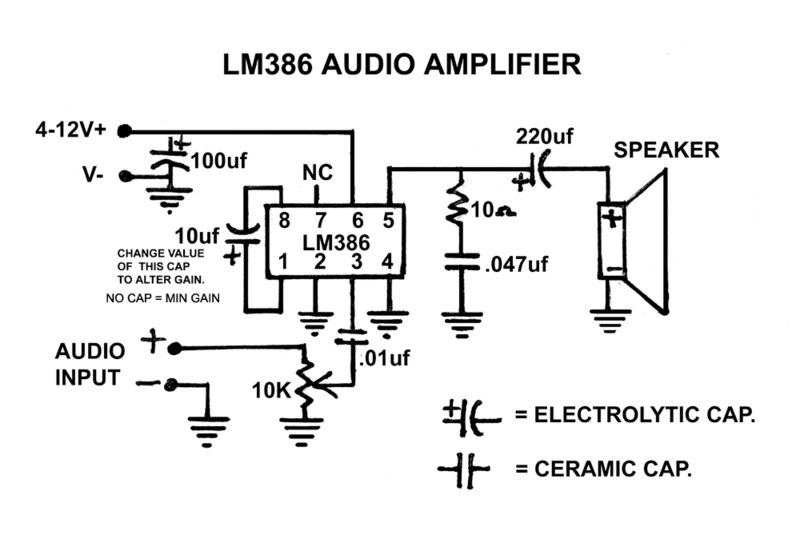 I checked other LM386 schematics and it seems that the correct choice is a polarized cap. Is that true? Yes it is a polarized cap. I guess I forgot to draw it as such. Good catch. 🙂 Nice build on yours by the way! Hi, I built this amp on my bredboard today. Great video by the way, I will try and fit it all inside an altoids tin as well. I think you meant to say the 10uF cap is polarized with the negative on PIN 8 not PIN 1. Well, that’s what I read on the datasheet unless my lack of coffee today is affecting my judgement. Ok, just finished fitting everything inside the Altoids tin. It’s a very tight fit. Next time I will double measure the space between the switch and pot. Great project, lots of fun, thanks! Found an easter egg. I wired the 10k pot backwards and when I removed one of the wires, (not the wiper) I picked up a local am radio station! As long as they are rated higher than your power supply, they’ll work. I am trying to build this circuit so i can turn my passive Subwoofer into an active one, but I am having trouble. I have checked and rechecked my parts and circuit layout on my bread board, but I cannot for the life of me get it to work. All I get is loud high pitched squeals tons of distortion and no useable signal at all. But it is loud. I am 100% sure that my layout matches the schematic, but my electronics knowledge is not that good so I am at a wall and have no idea what to check or change to get this to work. Any ideas? Check all the capacitors for correct polarity. Hmm, yeah there is a black line down them with a “-” in it. I assume this is the negative terminal, and these terminals match the schematic. I’ll flip them around to check though. If this is not the issue, any ideas what else to check? how do you connect a potentiometer on the breadboard? will i just connect 3 parallel wires on the 3 slots of holes of potentiometer to the breadboard?, and one thing, is there any specific size of wires to be use?. I need an ASAP reply, im doing this for my school project.. Yes just wire it the way you described and use a solid core 20 gauge copper wire. and another thing, i use a 9 volt battery source, will a 10 volts capacitor be enough for this? reply pls… need help!!! General rule of thumb with capacitors is that the voltage rating should be HIGHER than the voltage powering the circuit. 10 volt rating will work but a little higher is always better. ahh, will a 30 or 35 volts will be Ok sir? and will a 6 ohm speaker work too? tnx for the quick reply sir, i need to finish this by saturday, great video by the way. and one thing sir, where do i put the switch and the indicator? Can we double stack the LM386 chips and double the output? No. You can however build two of these circuits and have a stereo amp. In line on the positive power lead. Connect the diode after the switch and put a 470 ohm resistor on it. sir, is it ok to use a 35 volts electrolytic capacitors and 50 volts ceramic capacitor or should they be equal value in volts? my problem right now is the distortion of sound, I have to fix that or is there any other problem regarding with the distortion of sound? Yes that is OK but the distortion is from turning it up too loud. It is only 1/2 watt output. That 10uf cap between pins 1 and 8 seems to be the culprit.It gives too much gain hence the high distortion.A solution would to remove it completely. A separate preamp circuit could be used for gain but I do not know how to do that. Here in my lm386 amp on a breadboard http://www.youtube.com/watch?v=TAnJxbFr2k4 .Actually it sounds better in reality.The mic I recored it with missed a lot.Watch what happens when I turnup the volume .The distortion is very bad.When I add the 10uf cap betwwen 1 and 8 pins the distortion gets awful. How many watts should the resistors be? 1/4 watt should be fine. What do you think?Is there anyone to deal with the distortion?I did not use the 10uf cap between 1 and 8 pins.It distorts a lot.I would really like to see a preamp schematic for this amplifier. If you have the volume too high at the source it will distort. The solution to the crackling problem was to put a stable source of dc current.I replaced the battery with a 12v ad/dc adapter and the job was done. Dean – I emailed you directly about this … but you must be a busy man. I just wanted to point out that a note in your schematic image is incorrect. It says, “NO CAP = MAX GAIN” … It’s actually the opposite – NO CAP = MIN GAIN. Without a cap, the 386 has a gain of 20. With a cap, 200. You use the cap + a resistor to achieve values in between. Thanks Perry. I’ve been quite busy and hadn’t found time to reply to your email. I altered he schematic several months ago and added that note… with the error. OOPS! I’m always grateful when someone points out my errors. 🙂 I’ve corrected that note. Thanks again and … keep on hackin!